Carmelite orders are held by a Prior General, and perhaps the greatest of our priors general was Blessed John Soreth (1394-1471), a Frenchman who led the order from 1451 until his death. His main concern was for the reinvigoration of the order, which at the end of the Middle Ages was in need of renewal and reform. He also founded the so-called Second Order, the Carmelite nuns. He is usually depicted holding a ciborium (a vessel for holding the hosts consecrated at Mass) because at the height of a battle in Liège during which some soldiers had desecrated a church he risked his life to gather up the Blessed Sacrament and carry it back into the church. He stands for optimism and commitment to the future even when things seem at their worst. His feast is celebrated on 28 July. God of Truth, you give us conscience to influence our lives and to guide us in the right direction. May we be free of all those things that would silence that voice within us. May we learn to be our true selves and to resist the pressures to be less. May Blessed John Soreth teach us to be fearless in our loyalty to you. The Acute Spinal Ward at The Austin Hospital is where victims of spinal cord injury are moved after intensive care. We began supporting this charity was selected in 2007 because the highest percentage of patients through the ward are young males between the ages of 19 and 25. Most of the injuries arise from risk-taking behaviour by these young men. 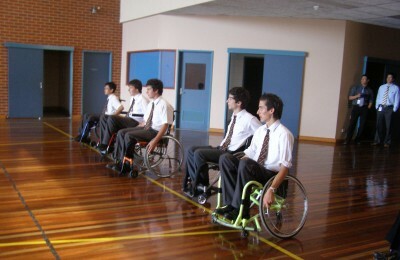 Our boys are our ‘target audience’ as our association with the ward also acts as an education program for our boys – Soreth students are known as ‘Ambassadors for Spinal Cord Injury Awareness’ and everyone who works on the Ward at the Austin is very aware of the boys from Soreth at Whitefriars and their fundraising. We also chose this charity as the Ward has had at least four former Whitefriars students as patients and the Senior Clinician Physiotherapist also has connections to the College. Since we started fundraising for the ward, a staff member’s husband has been a patient and just recently another former student. Every year we host our ‘Wheelchair Sports Night’ which is used as an educational and introductory session for our new Yr 7s and their families. The night consists of guest speakers, one who explains the work of the Ward, a young male spinal cord injury victim to speak about his experience and finally Gary Connor (father of former Soreth student Pierce) who is in a wheelchair and conducts wheelchair sports clinics – Gary speaks about his injury and his life since and then runs the ‘wheelchair sports’ session that everyone gets involved in! 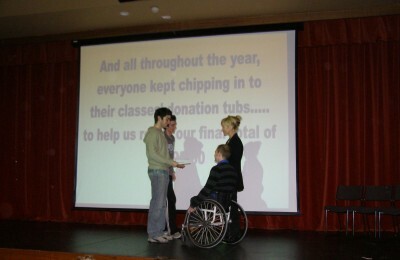 We also run other fundraisers throughout the year, which have included DJ competitions, 3-on-3 basketball comps, pick the Brownlow Medallist comps and video game competition mornings, they run class lunches where a flat fee is paid that covers the food and includes a donation to the charity. Twice a year we run a ‘3 Day Blitz’ where the pastoral groups ‘square off’ in pairs and challenge each other as to who can raise the most money in 3 days – these are hugely successful and generally the house raises over $1,000 in just 3 days! In the 8 years we’ve been fundraising for them, we have raised over $31,000.00 that is handed directly to the Ward.